“As golf lovers, we decided to crack open the enigmatic “feelings,” and design golf balls made especially for the day-to-day player,” the company says on its website. Nice words, but is it true? FORTE has burst onto the scene of late seemingly from nowhere, with lots of promotion and advertising. It is certainly a brand I was not aware of previously, and as well as the straight advertising they are aiming to further highlight their products with some free trial promotions and other marketing activities. As part of all that FORTE sent ASG a selection of their balls to try out. Firstly, I’d have to agree with them that most golfers pick their golf balls because of “a feeling”. For some very aware and focussed golfers that feeling may be the exact sensation they experience when their clubhead contacts the ball, and then their satisfaction level with the degree to which the ball then performs to their intended expectations. Nothing else. For many others, there are lots of other variables. For some golfers it is all about the brand. They play with “X” brand because it is “their” brand – their favourites pros use it and they like the ads (subconsciously or otherwise). Or if a golfer tries a new ball variety in the Saturday comp, and they win, you’ve got to be looking at a long term love affair right there! Then for others it’s all about price. As we said, FORTE is a new Aussie company trying to make its mark. So that’s got to be a bit of a plus in a market dominated by the big multinationals. So there was lots of research, testing, player stats, consultations and refinements. What they have come up with – currently – is four ball selections aimed broadly at different types of golfers, and at what appears to be a very reasonable pricing level. We should point out here that FORTE balls are only currently available in their own online shop (apart from one shop in Queensland), a situation the company says cuts out lots of middlemen. Apart from trial packs, the balls are only available as a dozen or more. Buy two dozen and discounts kick in, buy four dozen and there is a 12 percent discount and free shipping. FORTE sent us two versions of their balls to try, the “All levels of golfers” SS2 Soft and the more expensive Tour Performance aimed at more advanced players. The balls arrived literally as we were getting in the car to drive to Queensland for an extended visit, so unfortunately we didn’t have the benefit of trying them on our home track. That honour fell initially to the beguiling Tally Valley course on the Gold Coast. We chose to try the SS2 Soft balls first, and I realise – especially after writing all that guff earlier in this story about “feelings” – that I am automatically drawn to balls with “Soft” in the title (it definitely has to be written on the box somewhere). Probably also very factual that I like the feel of “soft” golf balls off the face of clubs/putters. I like the look of the FORTE balls, bright white, biggish dimples, and the SS2 has a putting alignment friendly stripe on the side. Playing a new course, especially one rock hard after apparently several weeks without a drop of rain, I was certainly getting plenty of distance on the long shots, and actually had to scale back at least two clubs on approaches. A lot of that obviously had to do with the conditions. It was also tough to judge on the unfamiliar greens, which were also very hard and fast, but the SS2 did feel very soft and responsive. As it turned out I played a number of rounds on the same course and as both the course and the FORTE balls became more familiar to me I must say they did grow on me. The balls were obviously very fond of me as well, as despite the numerous opportunities the course offered them to escape (bounded by a creek and a number of other water features) they steadfastly refused to part with my company. So I was able to attest that even in some quite abrasive circumstances in places, they demonstrated their durability and wore quite well. Overall, and for the average “day-to-day player” as previously stated, I think the company has done a great job with the FORTE SS2 Soft balls. They look good, perform well, and you can get them for a very good price. The FORTE website is very user friendly, there is a simple ball selector feature that advises you of a recommended ball for your playing ability, you can get a small trial pack, or even snap a freebie sample. Ongoing, if you decide on the SS2 Soft balls, you could get four dozen, with free shipping, for less than 90 bucks. Not a bad deal. I was taken aback for a moment because I thought I was going to have to explain the whole “FORTE” thing. I thought it is much easier for some people because they can just say “I’m a ‘big X brand’ kind of guy, so I only play ‘big X brand’”. 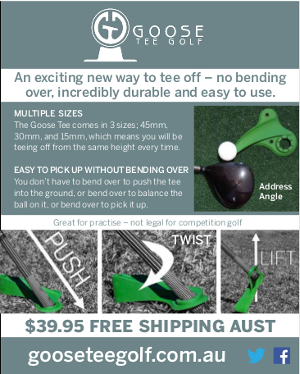 I did try the try a FORTE Tour Performance ball briefly but thought it a better idea to save them for next week (as I write) when I’ll be playing in the veteran golfers national championship on some of the Gold Coast’s top courses (Royal Pines, The Glades etc) – a great opportunity to give them a good workout and no doubt there will be lots of “Tour Performance”-worthy action happening on my part to report upon. We’ll do a separate review for the Tour Performance balls later.